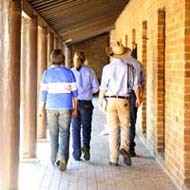 The College is part of the Tocal Agricultural Centre - a Centre of Excellence within NSW Department of Primary Industries. It consists of the College, NSW DPI Industry Development, Regional Services and Regulatory programs, Tocal Field Days and Tocal Homestead. The Local Land Services (LLS) is also located at the Tocal College, CB Alexander Campus.